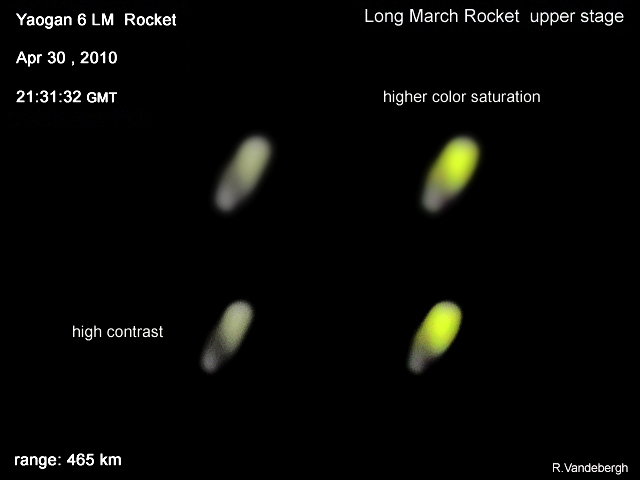 A Long March 2C rocket (Source: CALT). The development of the Chinese Long March 2 rocket family started in 1970 with the first attempted launch in 1974. The original Long March 2 was followed by several iteration, identified by capital letters (A, B, C and so on). The 2C version, whose first launch took place in 1982, it’s 42 meters 2 stage rocket, with a diameter of 3.35 meters. The rocket has a payload capacity of 3,850 kilograms low Earth orbit, or 1,400 kilograms to a Sun-synchronous orbit. The rocket has a good success record, with a single failure in 35 launches. The Shijian 11-01 March 2C second stage in an animation, showing the rocket through the air turbulence. On November 12, 2009, the Shijian 11-01 spacecraft lifted off on a Long March 2C rocket from the Jiuquan launching base near the border of Northern China (watch video below). The satellite was inserted in an orbit of about 690 km of altitude, with an inclination of 98.3 degrees according to tracking data. On September 5, 2010, I managed to capture a detailed image of the second stage from a range of 690 kilometers. The rocket-stage shows some surprising details. On april 30, 2010, I captured another high resolution image of a Long March 2C second stage, this time from a range of 465 kilometers. 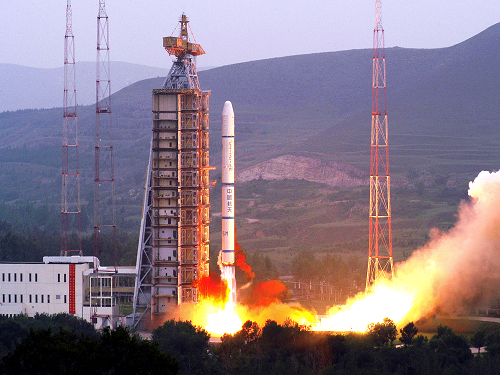 This is the rocket which launched the Yaogan 6 satellite into orbit on 22 April, 2009 from the Taiyuan Satellite Launch Center in China’s north Shanxi Province. We apparently see this second stage from a more favorable angle, showing probably (almost) full length. There is an interesting color visible which I have enhanced in the image on the right. A Long March 2C second stage captured from a 420 km range.